The morning light of Mount Scopus in Jerusalem woke me up through the small opening in the curtain, which was swinging slightly due to a pleasant, patting wind gliding into my room at the Dan Jerusalem Hotel. Soon, my friends joined me for a repetition of the previous morning’s one-of-a-kind breakfast at the hotel which once again, for the second day in a row, was so unique. The large, nicely decorated dining room facing the outdoors pool inspired a peaceful atmosphere. The typical, self service breakfast consisted of an extremely rich buffet and a salad bar, which occupied a much larger space than the dining area itself, offering whatever one could even think of – you name it. So, here is a short example of the available foods: From assorted breads and huge varieties of cheeses to fresh vegetables and tossed salads, fresh fruits, cereals, ice cream and yogurts, assorted lox and herring, to made-to-order omelets with multiple ingredients and, finally, beverages, all in generous, unlimited portions and quantities and excellent styles. One must try it all in order to enjoy this phenomenal kitchen and have an idea of what it really is. It was another bright day. We left the hotel and headed toward the way out of Jerusalem, west to Tel Aviv. We passed by the hundreds of vehicles carrying thousands of Israeli celebrants with multiple blue and white flags, making their way up the Judea hills in order to participate in the intended Jerusalem Day celebrations. Loud Israeli music as well as singing was heard from many of the vehicles, who made their way up the hills to attend the 44th Jerusalem Liberation Day parade since the Six Day War in June of 1967. At the bottom of the hills we reached the landmark point of The Valley Gate and crossed over to the large valley of Latroun, where bitter battles took place in 1948 between the newly formed Israeli army and the Jordanian Legion. The purpose of those battles was to secure the only main road from the sea shores to Jerusalem, which was then under siege and heavy shelling. As we reached the Latroun Valley, we exited the main highway to Tel Aviv, passed by the former British Police building, now the historical memorial center for the IDF armored units, and continued for another couple of miles through grapevine plantations. At the gate of what turned to be The Mini Israel Theme Park we found comfortable parking in its lot. We stopped at the ticket-box and shortly after made our way into the park. As we walked in we were told that due to the Jerusalem Day celebration they don’t expect masses to visit the park in the morning, prior to the celebrations, but later in the afternoon when people would make their way back home. So we found ourselves almost alone in this magnificent replica of nearly every landmark in the country – large cities and small towns, ancient and new; airports; sea-ports; rivers; lakes; mountains; parks; government buildings; hotels; theaters; museums; beaches; stadiums; municipalities; community centers; industrial parks and villages; railroads and transportation; and much much more – all in utmost precision of details and resemblance to reality. 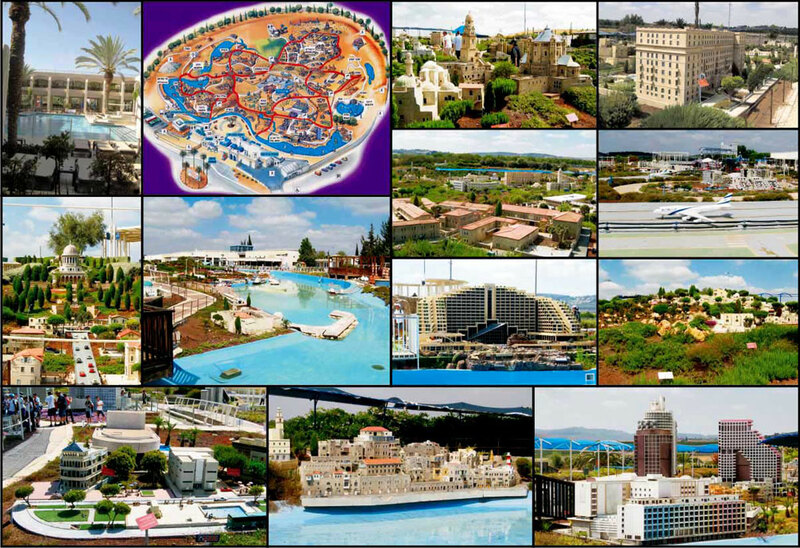 Opened in November 2002, the site contains miniature replicas of hundreds of landmarks in Israel. The tourist attraction consists of about 350 miniature models, most of which are on a scale of 1:25. We spent the rest of the morning hours at the park, strolling along the many walkways and well presented displays, usually two to three feet tall, feeling as if we were the legendary Gulliver in the Lilliputian Kingdom. Toward the end of the tour, we spent some time at a large cafeteria, where we had ice-cold drinks. We left the unique park on our way to Tel Aviv filled with exciting impressions and memories. The park and its beautifully designed and executed contents were absolutely worth the visit. Our next stop was at one of the Mediterranean, Middle Eastern and Israel�s most precious pearls � the ancient and modern compound of Old Jaffa. We parked our car and began walking the narrow alleys, stopping at some art and jewelry galleries. At the top of the central hill, we stopped to observe archeological excavations. The site was excavated mainly by the late Jacob Kaplan in the late 1950�s through the early 1970�s. Among his major discoveries were: A Late Bronze Age gate and a temple attributed to the Sea Peoples. Occupational remains of the Iron II period, Persian and Hellenistic periods were also unearthed. In 1991 a replica of the gate lintels, bearing the titles of Pharaoh Ramses II, was reconstructed by R. Ventura and Z. Herzog and erected in their original location. In 1997 Herzog conducted a short trial season at the site in order to determine the state of its preservation. He exposed additional parts of the gate's entrance floor and the destroyed debris above it and cleaned the top of some Iron Age walls to the north of the gate. He also found out that large parts of the site are buried under thick layers of modern fill. According to Christian legend, Jaffa was named after Noah's son, Japhet, who built it after the Flood. There are others who believe that the name derives from the Hebrew word "Yoffi" - beauty. From archaeological discoveries and ancient documents we learn that Jaffa has already existed as a port city some 4,000 years ago, serving Egyptian and Phoenician sailors in their sea voyages. Historians believe that Jaffa is the only port in the world which can boast uninterrupted inhabitation throughout its entire existence. The biblical account mentions that the cedars from Lebanon for the construction of King Solomon's Temple came in via Jaffa. The prophet Jonah departed from this city in his flight from God. Greek legend tells of the chaining of the beautiful Andromeda to the Mediterranean rocks facing Jaffa's shore. Roman legions, Richard the Lion Hearted, Napoleon and Turkish sultans all conquered the city. Towards the end of World War I, the city was conquered by General Allenby, ushering in the period of the British Mandate. The port of Jaffa (the sole port at the time) served as the point of entry for the increased Jewish immigration which came to resettle the Jewish homeland at the end of the nineteenth century and the beginning of the twentieth. The Arabs of Jaffa participated in the terror attacks against the newly established State of Israel and the Jews. Following the declaration of the State of Israel in May, 1948, Jewish defensive actions led to the flight of most of the city's Arabs, and shortly after that part of the city was re-settled by impoverished Jewish families whom the war had left homeless. In 1968, the Government of Israel and the Tel Aviv-Jaffa Municipality established the Corporation for the Development of Old Jaffa, entrusting to it the task of averting the total destruction of Old Jaffa's glorious past. 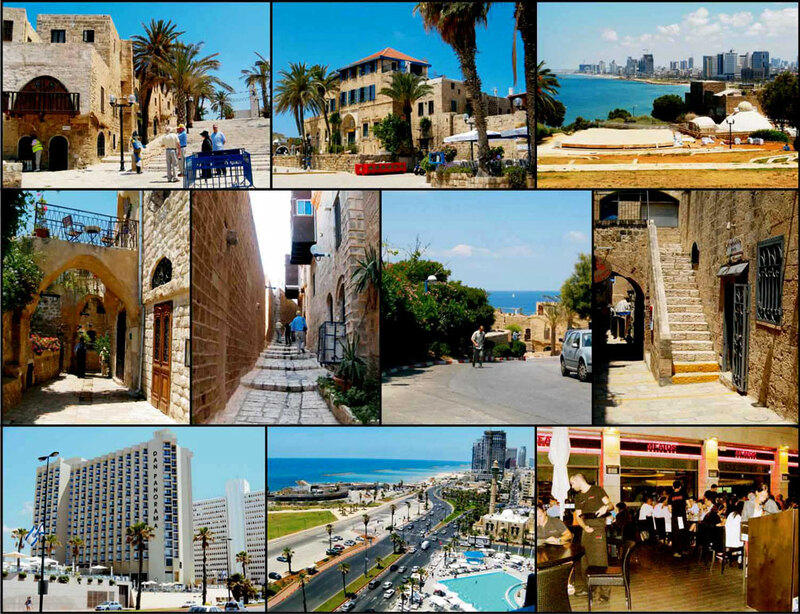 Old Jaffa has since become one of Israel's leading tourist attractions. It is filled with artists' quarters, studios and art galleries, aside archeological excavations. Shops catering Judaica and jewelry and art, line its narrow alleys which are named after the signs of the Zodiac. Visitors from both Israel and abroad enjoy dining in its unique restaurants or simply wandering around. People seem to gaze in fascination at the sight of the ancient Port and the rocks, and some are dumbstruck by the beauty of the renovated Jaffa Harbor set against the back drop of the city of Tel Aviv -the first Jewish city in modern times - a vital, dynamic and vibrant metropolis that never sleeps - and which has grown out of Jaffa via neighborhoods like Neve Tzedek and others. Old Jaffa in itself is a quaint city, more picturesque than ever, with romantic paths and gardens. All this, together with the Mediterranean's sun-drenched waves and the special lighting effects at night, serve to excite and arouse the senses and the soul. Hatachanah, the Jaffa old railway complex is a recently renovated historical site, now with shops and other attractions located next to the main road running along the beach from Tel Aviv into the Clock Circle of Jaffa, in the vicinity of the Dan Panorama Hotel, the Gibor Business Building and Old Jaffa. It took us about 10 minutes to get to the Dan panorama Hotel located on the southern beach of Tel Aviv, at the main road connecting the never sleeping city with Jaffa. I checked into the hotel and we left for an early afternoon walk north along the decoratively paved beach promenade erected by former Tel Aviv Mayor, Shlomo �Chich� Lahat. The day was beautifully bright, the Mediterranean was calm and the sun glared in the water with millions of dancing sparkles. The sand at the water was soft and tempting and tens of sunbathers were spread along the water line to get an early summer sun touch. Others were splashing in the relatively cold yet clear, blue water trying their skills in swimming. We passed by the Hassan Beck Mosque, from which Arab snipers shot and killed tens of Jews on the streets of southern Tel Aviv during Israel�s Independence War, until the newly formed IDF and Menachem Begin�s Irgun fighters took over the city of Jaffa on Passover of 1949, not without heavy casualties. A black curtain building has been erected on the beach across from the Dan Panorama Hotel, named the Etzel Museum, to commemorate the battle to free Israel from the British Mandate and those who fell during the battle on Jaffa and other Irgun operations. Next to the museum was located the former Dolphinarium water park, at whose discotheque 21 Israeli youth were murdered by an Arab terrorist ten years ago, on June 1st of 2001. After a moment of paying respect to the fallen, we passed through the Herbert Samuel Square, in which the Israeli flag has been raised on a high pole the night of November 29th, 1947 with the presence of tens of thousands of jubilant Jews, who celebrated the UN declaration of the Jewish State in Palestine, voted that night in Lake Success, NY. A few steps north, we noticed the American Embassy building, which was barricaded and protected like a fortress. That was the beach segment many Israelis used to visit on hot summer days. At that site, the morning of June 22nd of 1948 seemed to be no different for the sunbathers, except that everyone were stopped by armed Israeli soldiers at a military barrier set on the beach, prevented from proceeding to that popular area of bathing. A burning ship, producing heavy black smoke, was stuck in the shallow waters very close to the beach. Machinegun shots were heard from all over, hitting unarmed people running desperately on the beach for shelter. Later on it was announced that an IDF elite unit, commanded by David Ben Gurion, Yigal Alon and Yitzhak Rabin, opened fire on the Altalena, an Irgun ship arriving from Europe, carrying weapons and nearly 1,000 Jewish fighters. Menachem Begin�s fighters on the ship were mostly holocaust survivors, making Aliyah (Hebrew for immigration) to Israel in order to participate in the battle against the Arab aggressors. The ship was hit directly by an IDF shell which was launched from a canon, later nick-named �The Holy Canon�, set a short distance to the north, where today is located the Tel Aviv Hilton, back then a former British barracks. The arsenal on the Altalena exploded and the ship caught fire. Begin, who was on the ship, ordered his fighters to jump ashore, where they were confronted by the IDF unit�s machinegun fire. 20 Irgun members were killed on the beach by the IDF fire and 87 were wounded. Being then a kid with no clue about right wing or left wing, the fact that Jewish soldiers shot to kill at Jewish Holocaust survivors in the newly founded Jewish state was beyond my comprehension. It was engraved into my memory for the rest of my life, as the most unforgiven act Jews could have ever commit. Soon, the harsh memories were replaced by the real images of children playing joyfully on the golden beach and splashing in the clear blue water. We ended our walk with excellent coffee and cheesecakes at the lobby of the Dan Tel Aviv Hotel, located at the northern promenade on Hayarkon Street, the flagship of the Dan Hotels in Israel. The way back to the Dan Panorama was under the purple-reddish colors of the magnificent Israeli sun setting west, into the Mediterranean. A quick shower and we were again in the car on our way for dinner. I met for dinner with Avner Gordon, the Country Manager in Israel for Swiss International Air Lines, who recommended Meatos Kosher Gourmet Grill-Bar restaurant, established in 2004 and owned and operated by Chef Kobbe Abed. Meatos is located in central Tel Aviv, adjacent to the Kameri Theatre and the Tel Aviv Magistrat. Meatos' kitchen is based on carefully selected ingredients processed under highly supervised today's standards. Meatos provides kosher business menus and meals during day time and turns into a top quality kosher gourmet restaurant and bar in the PM hours, treating its patrons with unique menus, unique decoration and unique atmosphere, which together with the leather seating and the best sound system combine into a very special culinary experience. Meatos also provides its patrons a unique ballroom which can accommodate 80-160 guests with comfort, style and utmost pleasure. Most of the dishes at Meatos are assembled of tasty ingredients prepared and cut delicately according to Chef Kobbe's prescriptions, with his special combinations of herbs, oils and spices. During the evening, we indulged ourselves with a significant variety of Kobbe's dishes and ingredients, starting with house appetizers from baked eggplants laid on green tahini to an Israeli thin-cut vegetables salad in a drop of olive oil, from broiled portabella on a tiny bruschetta layer to an Asian root salad. Other dishes include varieties from avocado chicken breast chunks on softly cooked Jerusalemite artichoke leaves to goose liver pate, from thin slices of carpaccio beef filet in balsamic olive oil to veal on tiny vegetable salad bedding, and from baked salmon in chilli with drops of oil to house fish served on avocado salad. Meatos' main course was delicious though we were unable to eat the entire large variety offered on the menu: From special beef filet and steaks to chicken steaks and liver, lamb kebab in Port and eggplants dressing, to steak and hamburger Entrecote served on root vegetable puree spread on a fresh role. The menu also offers other goose, lamb and fish dishes, all served with Kobbe's unique dressings, herbs and spices, as well as pasta and vegetarian dishes. The desserts offered at Meatos are also unique to the place and vary from chocolate fudge to apple and pecan pies with almond or pistachio cream, sorbets, blintzes and season's fruits. The next morning, very early before dawn, my Swiss International Air Lines flight took off from Tel Aviv's Ben Gurion Airport on its four hour route to Zurich, in Switzerland. Prior to my trip, my editor has arranged for me a visit inside Zurich airport and the kosher catering service Swiss International Air Lines is using for Jewish passengers. Robert Beck, an official from the airline greeted me at the luxurious business class lounge, where I had some refreshments, then walked me to his office, where I stored my luggage. First, we walked over to the check-in kiosks set to reduce wait time from passengers checking in. The nest morning I was due to use one of the machines while checking in for my flight back to New York. Soon, we were walking down the stairs to the underground level of the airport, where, for the first time in my life, I had a glimpse on a modern luggage conveying system. The space was enormously large with hundreds of raised conveyors moving with extreme noise from and to all sides in a sophisticated network. Each and every piece of luggage on the conveyors was scanned and directed from one conveyor to the other in an extraordinary order and precision. There were only a handful of employees, armed with bicycles for any rare event when a piece of luggage is stuck, gets stranded or loses direction. I wanted to take some photos at the facility but I was denied politely by my hosts for their reasons. The 30 minutes I spent at the luggage conveyors were of great excitement as one doesn�t see this kind of hidden operation that often. As we emerged out from the luggage conveying facility, I was greeted by Benedict Fanconi, Swiss International Air Lines� Inflight Development Intercontinental Manager, who led me outside the terminal where we took a local tram for a five minute ride. We ended up at the Schalom AirCatering SA�s facility. At Present, Schalom AirCatering SA is the only kosher supplier in Switzerland who meets the standards of the different airlines regarding kashrut (Jewish dietary laws), hygienic regulations and other legal restraints. Rafael Mosbacher, the facility�s GM greeted us and led us on a tour in the production facility, dressed in protective plastic outfits. He told us about the service: It was in December of 2006, that the premises in Glattbrugg have therefore been equipped with the most advanced technology. They are constantly being supervised by an approved Rabbi and hence meet the most restrictive standards of kosher food production (Kosher Le Mehadrin). While having a very tasty glatt kosher lunch with Mr. Mosbacher, prepared in their kitchen minutes earlier, he provided me with more information about his company: Schalom AirCatering SA guarantees 100% kosher food which is also an advantage for allergic people and for other requests regarding a special diet. The food purchasing and processing is thus continuously controlled by an on-site rabbinic supervisor (Mashgiach). It is his responsibility to supervise the kashut status of the production and checking � as well as verifying � every food product that arrives at the facilities (if acceptably kosher). Obviously, the development of the new production site entailed the implementation of latest machinery, equipment, facilities, systems, devices, etc. as well as the introduction of an HACCP system including accurately documented food traceability to meet the highest quality standards. The cooking processes are based on the �cook & chill� principle - that is immediate re-cooling of pre-cooked meals within a very short time. The cold chain�s reference temperature is thus guaranteed until the delivery at the customer since also the transport lorry is cooled. Furthermore, Schalom AirCatering SA keeps records of their produced and delivered food items according to law requirements. To conclude: Schalom AirCatering SA is fulfilling the requirements for delivering highly qualitative meals in line with kashrut, government and airline rules. Upon my return to the airport, I picked up my luggage from Mr. Beck�s office and walked over to the Radisson BLU Hotel Zurich Airport. The New hotel is located only a few feet away from Zurich Airport and the train station. All 330 rooms offer free Wi-Fi, and LCD TV and a laptop-size safe. The soundproof panorama windows provide spectacular views of the airport or the inside of the atrium, where I was impressed with the amazing 52-foot-high wine tower made fro colored glass sheets with 4,000 bottles of wine and champagne. 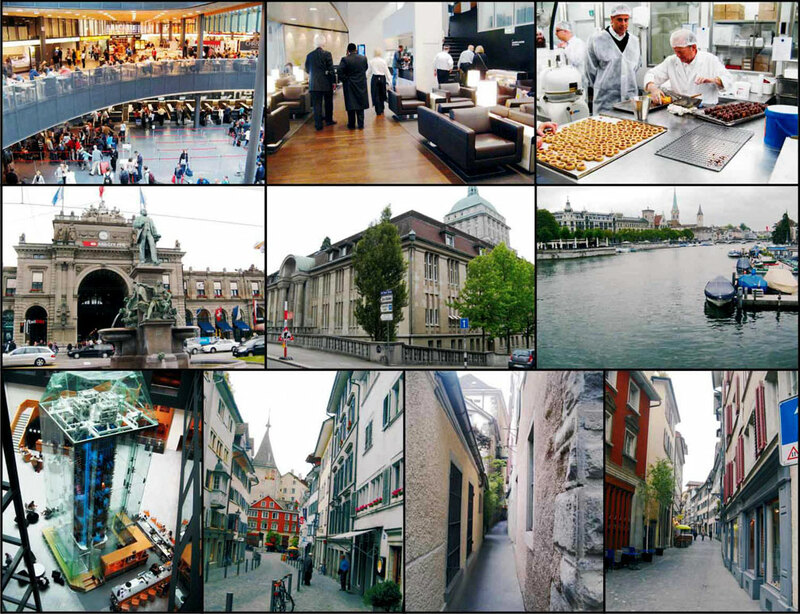 After a comfortable 10-minute train ride from the airport, I reached Zurich's famous Central Bahnhof (Main Railway Station), where I met my Zurich Tourism Office�s appointed tour guide. We took a tram across from the Central Banhof for a few stops up the hill, to the main building of Zurich University, founded in 1833 and located at R�mistrasse 71 CH-8006 Z�rich, overlooking the Limmat River. After we got off the tram we started walking down the hill through very long staircases and alleys. As the city and the river appeared above the trees and the buildings in front of us, the scenery became more impressive. We passed through the old Jewish Quarter then took a tram to Zurich Lake, where we took another ride at the beginning of the river, on a passenger boat, back to the Central Banhof. In a few hours, I managed to absorb the architectural styles of the city, its variety of landscapes and views, its landmarks, its inhabitants, its public transportation and much more. I concluded my day in Zurich at a kosher restaurant, Chaim Baranes, owned and operated by Israelis. Chaim Baranes Kosher Restaurant Zurich is a small 30 seat home-style meat kosher grill restaurant, no dairies served. The food was of excellent quality, based on typical kosher Israeli, Middle Eastern and Mediterranean cuisines, which made me feel very comfortable. Children are welcomed. The next morning, I checked in at a Swiss International Air Line check-in kiosk at the airport and pretty soon was sitting comfortably on the plane which took off smoothly on its way to New York.